The Nigeria Police Force has placed an order restricting movements within the boundaries of Bayelsa and Kogi States with effect from 6.00am to 6.00pm on Saturday, December 5. The force said the restriction was in furtherance of strategies designed to prevent electoral fraud and violence and ensure a hitch-free governorship election in Bayelsa State, and supplementary election in Kogi State scheduled for Saturday, December 5, 2015. 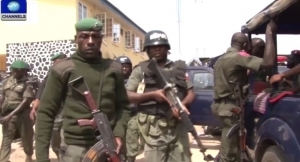 In a Statement by the spokesman for the police, Olabisi Kolawole, the Inspector-General of Police, Solomon Arase, who approved the restriction said that while the restriction of movement in Bayelsa is within the boundaries of the State, intra-city vehicular movement is restricted in Kogi State. The Police however, stressed that persons on essential duties such as Ambulance service providers, officials of the Independent National Electoral Commission on-duty, security men, accredited election monitors/observers and accredited journalists among others were not affected by the order. While imploring the general public for their understanding and cooperation towards the enforcement of this order, the Force noted that the order was informed by the need to forestall plans by criminal elements to undermine the electoral process as gathered through intelligence reports. The Nigeria Police Force advised travellers to take advantage of alternative routes to their destinations where necessary within the hours of the restriction of vehicular movement on Saturday, December 5, as Police, complemented by the military and other security agents on duty at strategic points, would subject motorists and other travellers plying the affected routes to civil and meticulous security search. The police also assured all law-abiding electorates of a secure and enabling environment to exercise their franchise, but warned all security details to refrain from accompanying their principals and politicians to polling booths and collation centres during the election. “Only security personnel specially assigned for election duties must be seen within and around the election designated places,” the statement read.